Atmel has expanded its wireless product portfolio with a new family of solutions targeting the rapidly evolving Internet of Things (IoT). Essentially, the new SmartConnect family combines Atmel’s ultra-low power MCUs with its wireless solutions and complementary software into a single package, allowing designers to easily add wireless connectivity to any embedded system. This new lineup includes Atmel’s SmartConnect Wi-Fi modules, an integration of the company’s ultra-low power Wi-Fi System-on-Chip with a Cortex M0+ ARM-based MCU, and the SmartConnect ZigBee SAM R21, a single-chip integrating Atmel’s ultra-low power ZigBee solution with a Cortex-M0+-based MCU. Atmel’s SmartConnect solutions can be deployed across a wide range of markets, helping to accelerate development time for cost-effective, battery-operated applications in the residential, healthcare, industrial, smart energy and wearable spaces. 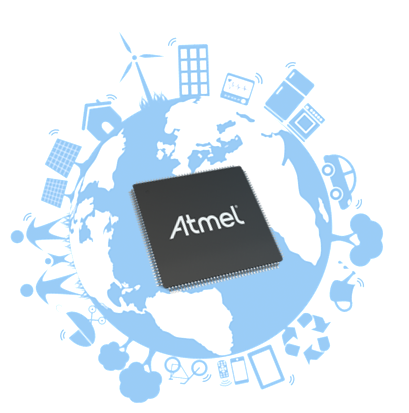 “Atmel’s Wi-Fi solutions deliver industry-leading low-power consumption and are the leading market solution for power-constraint applications such as remote controls,” explained Reza Kazerounian, Sr. Vice President and General Manager, Microcontroller Business Unit, Atmel Corporation. As Kazerounian notes, ultra-low power wireless connectivity is critical for embedded applications in the era of the Internet of Things. “[That is why] Atmel’s SmartConnect technology is about simplifying the use of embedded wireless connectivity technologies and enabling users to accelerate their time-to-market. This simplicity allows all players to participate in the IoT market, fueling the innovation needed to accelerate adoption,” he added. Greg Potter, Analyst, SNL Kagan MRG, expressed similar sentiments. “With over 50 billion devices predicted to be connected by 2020, it’s important for embedded companies to provide an ultra-low power turnkey solution that brings a complex mix of embedded and connectivity technologies in a single package,” he said. Providing designers with flexibility to help accelerate development, this new family of modules bring wireless Internet connectivity to any embedded design. The first products are an ultra-low power lineup of Wi-Fi modules that enable battery-powered IoT endpoints such as thermostats, temperature sensors through Wi-Fi connectivity – without compromising battery life. These highly integrated modules will enable designers to lower their overall bill of materials while integrating IEEE 802.11 a/b/g wireless connectivity. 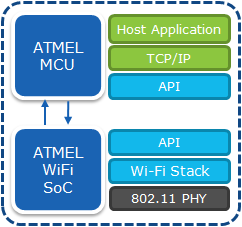 Additionally, the new Wi-Fi modules provide an integrated software solution with application and security protocols such as TLS, integrated network services (TCP/IP stack) and standard Real Time Operating System (RTOS) which are all available via Atmel’s Studio 6 integrated development platform (IDP). SmartConnect Wi-Fi is slated to kick off mass production in May 2014. Building on Atmel’s long history of ultra-low power ZigBee solutions, these new products integrate Atmel’s ARM Cortex-M0+-based MCUs with a robust peripheral set and its high-performance RF transceiver. The new single-chip series is available in extremely small 5x5mm 32-pin and 7x7mm 48-pin package, effectively saving board space and reducing the overall bill of materials. The devices ship in a variety of memory densities and are qualified for industrial temperature grades up to 125C, making them ideal for wireless lighting control applications such as ZigBee Light Link. These new devices are fully supported by the wireless composer in Atmel’s Studio 6 IDP and help accelerate development time. The ATSAM R21 Xplained PRO board is already available at the official Atmel Store, with Atmel currently sampling the ATSAM R21 series to select customers. Public sampling will be available at the end of March with production quantities slated for July 2014. Pricing for the SAM R21? Starting at $2.75 in 10,000-piece quantities. This entry was posted in IoT, Product News and tagged ARM Cortex-M0+, Atmel, ATSAM R21, embedded applications, Greg Potter, Internet of Things, IoT, MCU, microcontroller, Reza Kazerounian, SAM R21, SmartConnect, tag1, WiFi, Xplained PRO board, ZigBee on February 24, 2014 by The Atmel Team. White Systems ApS is proud to offer a Wi-Fi module as complete platform solution to support wireless functionality with TCP server and UDP server at very competent prices. Module is based on TI CC3000 Wi-Fi chip and Atmega328p –with physical dimension of 30mmx18mm. The Wi-Fi Module is programmed and controlled with a simple ASCII command language – 3 instructions are need to start TCP/UDP server.